Rhodes daily tours, Rhodes VIP private services, Rhodes taxi transfers tours , Bus Island transfers, Rhodes minibus vip services .We cover you 24hours a day from every destination on Rhodes including the airport and port. During your holiday here on Rhodes Island, it would be great for you to see some of the fabulous sites and enjoy the wealth of culture this island has to offer. Our aim is to give you the best transport services available on Rhodes. We have everything covered from your transfer from the airport to your family tours or private tour from the port or your hotel. We have years of experience and many holidaymakers have benefited from our knowledge and services making their experience of Rhodes truly unforgettable. Our drivers and team are all highly professional, extremely knowledgeable and have been assisting in welcoming many travellers to Rhodes for over two decades. Our experience and knowledge are second to none. Our private tours can be arranged with a qualified guide or just the driver to give you all the history of the places you visit plus, we offer you flexibility in adapting your tour to suit your requirements and tastes. There is no question about it that a private tour is the most comfortable, relaxing and best way to experience the island taking you directly to your destination without waiting for the crowds and losing valuable holiday time. If you are travelling in a group then you can arrange one of our group excursions so you can enjoy the day altogether in an air-conditioned minibus or coach. Of course, you have come for the sun and beach too which is more the reason to let us show you around the island going to the most popular places or to design a tour for you with the number of hours at your disposal therefore not losing valuable relaxing time away from the pool or beach. It’s true what they say, the locals know best, they know the secrets and hidden treasures and the places that can be found off the beaten track. So don’t waste time let us show you a taste of the island that you can take home and remember forever. We look forward to meeting you! See our most popular Rhodes tours & VIP services here! Explore the medieval city which is Rhodes ‘Old Town’, a living and breathing historical site. See the Acropolis of Rhodes which is situated atop the highest part of the city. Visit the beautiful monastery of Filerimos and Butterfly valley. Arriving by cruise ship or looking for something different? We can arrange a day to suit your requirements and tastes that you will remember for ever.Send us your ideas and what you enjoy doing in your spare time and we will offer our suggestions. Sample a little luxury with a loved one or group of friends on our luxury yacht. Enjoy the coastline and its wonderful sunset whilst relaxing and sipping a glass or two of champagne. A great way to celebrate a special occassion. For those who are looking for an adventure-the ultimate mix of culture and 4x4 fun! Haggle away in the Marmaris bazaar for leather, gold, carpets t-shirts & more. 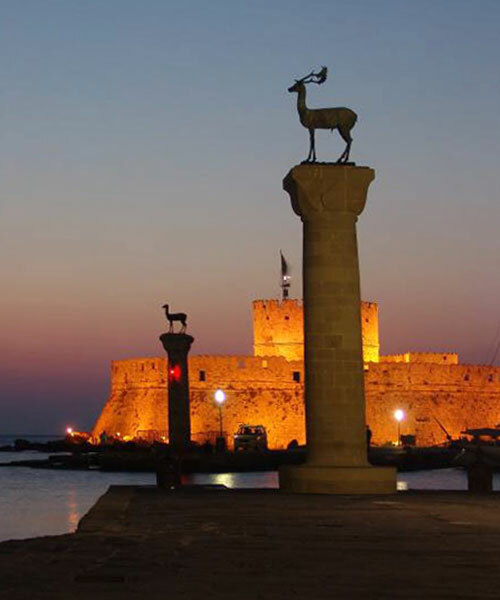 View the best of Rhodes City the islands capital.Walk the streets of the Old Town and see the Grand Masters Palace.Pass were the Colossus once stood and view the Temple of Rhodes.With enough time for shopping and Coffee too. Experience what our diverse island has to offer. The valley of the butterflies, Ancient Kamiros, sample the local firewater at Siana and more-there's something for everyone. Guided Tour. Rhodes has an amazing waterpark the largest in Europe.Lots of rides, lots of fun for all ages and quiet swimming areas for those who wish to relax get a tan and enjoy a cocktail or two. Visit seven springs and wonderful Lindos.Take time for a swin in the beautiful bay of Charaki and some lunch before your retun to your hotel. In a sheltered, southerly position around ten miles off the Turkish mainland, Rhodes enjoys just about the best climate of all the Greek Islands. The friendly locals are used to catering for foreign visitors, and it shows in the high standards of service in the hotels and restaurants on the most cosmopolitan of Greece's top holiday islands. Steeped in history thanks to the influences of the many invading cultures, Rhodes offers many archaeological sights well worth a visit. Rhodes Town offers you two towns for the price of one - the modern island capital has broad tree-lined avenues, excellent shopping, and great nightlife, whilst the magnificent quaint old town is a stunningly well-preserved Crusader fortress city, built by the Knights of St John, and is a Monument of International Heritage as identified by UNESCO. There are numerous excellent sandy beaches around the coastline, most with a good choice of watersports, facilities and plenty of sunbeds and umbrellas to hire. Right at the South tip of the island is Prassonissi beach a mecca for windsurfers, with two large sandy beaches, split by a causeway out to an island perched out to sea. Rhodes is renowned for its sunshine record and cloudless skies combined with its heritage, romantic chapels and wedding venues, it's easy to see why Rhodes is such a popular holiday and wedding destination!